The Facts, Philosophy, Religion, Reform and Freedom of Spiritualism / Spiritualism, its Tests, Harmony, Philosophy and Religion / A Journal of Distinctive and Harmonic Spiritualism. Auburn, NY. Publisher: U. Clark; P.J. Beeker. Editor: Mr. and Mrs. Uriah Clark, assisted by Miss Mary Jane King. 1/1, November 15, 1856-January 14, 1860. $1.00 a year, 8 pp., "royal octavo"/quarto, 9 1/2 x 12 1/2. Clark's Spiritualist Register for 1858 estimates (hopes for) a circulation of "several thousand" by year's end. The 1859 Register notes that the journal was "Published during the financial crisis only every other week." The journal had a tendency towards the phenomenal and marvelous ("Man Lifted by Spirits," "Rheumatism Cured Instantly"). Clark was yet another Universalist minister who turned to spiritualism and became a medium. He was a demon of energy for the cause and was one of the organizers of the first spiritualist camp, at Pierpont Grove, Massachusetts, in 1865. In the mid-1860s he allied himself with the "free love" side of the movement and later abandoned spiritualism and lectured widely as a debunker. The journal included a "General Register" that included all of the prominent mediums and lecturers of the era, , including T.L. Harris, S.B. Brittan, William Fishbough, Charles Partridge, J.W. Orton, A.J. Davis and and his wife Mary Fenn, J.B. Dods, Cora Scott Hatch, Herman Snow, A.B. Child, Joel Tiffany, J.B. Conklin, Mrs. E.J. French, Katie Fox, William Van Vleck (before he became a debunker), and P.B. Randolph. 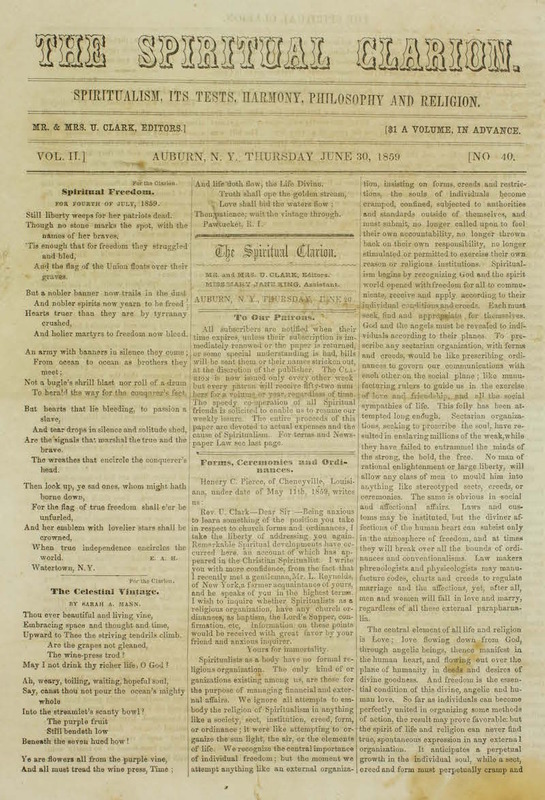 It also featured a "Boys' and Girls' Corner" (usually written in verse for some unknown reason), as well as Clark's articles, correspondence and comments on issues of the time. University of Rochester; Western Reserve Historical Society; American Antiquarian Society.